Amazon has just announced two new 6-inch Kindles, the Kindle WiFi and a new Kindle 3G. The WiFi only model costs $139 and the 3G plus WiFi version costs $189. Both models are now available for pre-order and will ship to 140 countries beginning August 27th. The WiFi model comes in black (graphite) and the 3G model is offered in black or white. The new Kindles come with hardware and feature upgrades compared the now out-of-stock Kindle 2. Most notably, they come with the new Pearl screens from E Ink that have 50% improved contrast, the same screen that the new Graphite Kindle DX has (here’s some photos and video reviews of the new higher contrast screen on the Kindle DX review page; it’s quite an improvement, especially when reading in lower light). 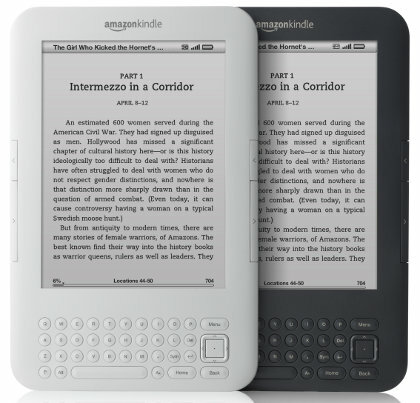 The new Kindles are smaller than the previous Kindle 2, with a 21 percent smaller body and 15 percent lighter build. Despite the smaller size, they’ve managed to cram a lot more battery life into the device: up to 1 month with wireless off and 10 days with it on. They’ve also doubled the internal memory to 4GB and have improved the page refresh rate to make it 20 percent faster. New WebKit-based Browser (experimental): The new Kindle uses a new web browser based on the industry-leading open source Web browser engine, WebKit. The updated browser is faster, easier to navigate, and provides a new “article mode” feature that simplifies web pages to just the main text- based content for easier reading. Web browsing with Kindle over 3G or Wi-Fi is free. New Lighted Leather Cover: The all-new Kindle cover features an integrated, retractable reading light that lets you read comfortably anytime, anywhere. The light is a permanent part of the cover, so it’s always with you, and hides away into the cover when not in use. The high-quality LED light illuminates Kindle’s entire paper-like display, adding brightness without adding glare. Amazon’s patent-pending hinge system secures Kindle in place and conducts electricity from Kindle’s battery to the reading light, eliminating the need for batteries. The conductive hinges are gold-plated to ensure a reliable electrical connection. Gold is used because of its ability to make good electrical contact even with low force and for its corrosion resistance. The Kindle cover is sold separately.